Does Rice Powder In Mineral Makeup Support Bacteria? We receive phone calls or emails on occasion from customers letting us know how great their skin is doing since purchasing our mineral makeup products. There is no shortage of love in regard to everything we offer our customers, including the moist method of application tutorial we provide for better coverage. However, some get confused by other mineral makeup companies writing either in their blog or directly on their website about Rice Powder and how it promotes and supports bacterial growth if you get it wet or store the container in your bathroom. These companies further add that any product containing rice powder must be preserved, so it is best to avoid them altogether. One thing we have learned in all our years of providing exceptional mineral makeup to our customers outside the norm, is many women require our addition of rice powder since they are highly sensitive to other overused ingredients like bismuth oxychloride and mica based formulas. Their skins level of sensitivity can't tolerate other mineral brands that contain these otherwise inert ingredients so our rice powder formulations are a true skin saver for these women, especially women that have rosacea or cystic acne. 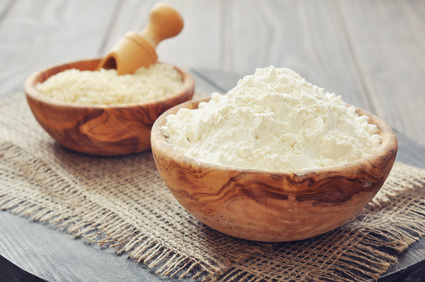 We also realize that rice powder is an ingredient our competitors either have chosen not to use or they repackage their supplier's brand whereby they don't have a choice. So in other words, what or how they want to explain the problem with rice powder or any other disliked ingredient does not typically come from scientific data, but a personal belief or simply to cast aspersions against that ingredient to promote their mineral makeup brand. In keeping that in mind, let's take a look at reality here and not rely on unsubstantiated statements in order to proclaim what is nothing less than a ridiculous theory. How Does Bacteria Actually Grow? First off bacteria require the perfect environment for multiplying in mass numbers and only if the environmental conditions are uninterrupted, then you will have a major bacterial invasion. Time ~ This is determined by the other 4 factors for sustaining absolute perfect conditions. But it can be in as little as 4 - 6 hours the growth rate will begin. Now, not all bacteria have the same growth requirements. For instance, bacteria that we find growing in a skin cream or mineral makeup jar containing moisture is typically 'aerobic' so it requires a 6th element for optimum growth, Oxygen, (opening jar) and in some cases light. Whereas, the bacteria that causes acne is 'anaerobic', not requiring oxygen or light, such as a blocked pore with sebum as it's source of food, not a makeup ingredient. In essence this is a fermentation process in a warm, dark, moist spot on the face, so when introducing oxygen component like a Hydrogen Peroxide, the bacteria are killed. If optimum conditions are not met for any type of bacteria a single cell may die before it can even reproduce. Once given the right conditions however, one cell can multiply into two identical cells, then each cell will continue to multiply two by two, right into the millions or billions until the growth conditions diminish. In all cases however, the one consistent common denominator is water or moisture was added to the medium to perpetuate growth. When wanting to grow or culture a bacteria for science research, a moisture element is incorporated in every scenario otherwise the bacterium just sit there and does nothing until it dies. Lag Phase - This is the first phase in bacterial growth. This is when the bacterium tries to get used to its environment. This is referred to as the "lag" phase due to it being a very slow process. Log Phase - This is what happens once the bacterium has acclimated to its environment and starts to multiply in numbers exponentially. Their numbers mass produce in continuous succession in a short period of time until the environmental factors start to diminish. 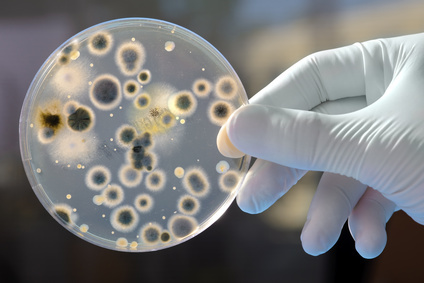 Sometimes different types of bacteria can be confused for mold growth when it is actually bacteria exploding in numbers. Stationary Phase - This is when the growth comes to a halt due to the diminishing of food, nutrients and other environmental requirements caused by the increased number of bacteria competing for the nutrients and oxygen. Death Phase - This is when bacteria start to produce or build up toxic wastes that are harmful to them which along with the scarcity of food and nutrients, ultimately lead to their death. What Does This All Mean In Relation To Minerals Containing Rice Powder? Not a thing! In short, if we look at the information above, the scientific data does not support the theory that rice powder in mineral makeup will grow bacteria when it gets moistened in terms of a single application or if it is sitting in your bathroom. All powders (fillers), including rice powder, are dry and inert ingredients in the jar especially with the lid coming off for only the time it takes to use a single application, and they remain dry absorbing moisture throughout the day on our faces. When mineral makeup is applied with the moist method, the powder dries immediately and really never is what you would call "wet" since the moisture is actually on the brush not on the powders per se. So, no bacterial growth can or will occur. This further makes the argument that a bathroom would have to remain humid, such as after a steamy shower, continuously for 24/7 or you would have to live in the middle of a rain forest to reach sustained levels of high humidity. Of course we all know that if our bathrooms were like a lush, tropical rain forest, then we would have more to worry about than bacteria in a jar because our walls and baseboards are going to be harboring growth of mold, mildew and all kinds of bacteria. The reality of whether or not there is sustained bacterial growth in a mineral makeup jar is based on some very simple principles. Between forced air, steam dissipating once the bathroom door is opened and so on, the conditions are never optimal whereby bacteria will never get past the 'lag' phase. If any growth began (and a big "if") in a time frame of what would amount to less than an hour, it is quickly interrupted with a change to the environmental conditions. Moisture dries, the 'lag' phase is stalled and 'log' phase can never take hold because there simply was never enough time to evolve since any minute humidity is inconsistent throughout the course of a day. Let's also look at the other factors, such as, most mineral makeup is stored in a closed jar in a drawer so the powders are dry and remain dry. Another fact is that most of us do not keep our homes at the optimal temp needed by bacterial growth of 77°F or higher. We are baffled by how these stories begin and propogate, but since we have built our business on science and integrity, we will continue to provide the accurate, scientific information to our customers seeking it. To put things in perspective in relation to this misguided theory on bacterial growth in mineral makeup products containing rice powder, the type of moisture it would take, would be to the point of caked, no longer free flowing, similar to a pile of wet sand or when making a facial masque and then it sits on your counter for a few hours. We know of no situation of any customer having their mineral powders even come close to this scenario. The optimum condition for bacteria to grow is inside a skin cream jar would be based on oil and butter emulsions which is a moisture rich environment. Now add a trace amount of water via wet hands going into the jar or just the fact water is used to create most skincare emulsions. This will be prime territory for bacteria to grow to the maximum numbers. This is why a preservative system is necessary for providing safety to the consumer even in waterless skincare emulsions. Pressed powders is another one! These will actually pose more of a problem than a loose powder due to the repeated use of a brush on the face and then back onto the powder, repeating the application over and over. This causes buildup of bacteria, skin cells, sebum (food for acne bacterium) and any skin cream or medicine you used on your face. The pressed powder of color is virtually a dirty germ pot and also why most manufacturers incorporate a preservative when creating this type of makeup application. Moisture, oils or synthetics are typically used to press the color into the case. However, in this application, preservatives do little to keep your pressed powders clean, nor are they effective since each consecutive use creates oxidation and decomposition of the preservative since pressed powder containers are rarely air tight. Mineral Makeup Containing Rice Powder Supports Bacteria - True Or False!? So many times we must look through an ulterior motive for why someone wants to fabricate their own science and confuse the less informed public. Whether it is through marketing tactics or bad mouthing without evidence, ie parabens, the list seems to be endless for why certain ingredients are attacked without basis. That is why we have to disseminate the data and then use only a touch of critical thinking to really understand the actual purpose behind the information. Use our mineral makeup with confidence because we can assure you that even mineral makeup brands that do not contain rice powder will also grow gram positive and gram negative bacteria if conditions are optimal. No mineral makeup is immune from bacterial contamination if water is introduced and then trapped inside the jar. At the very least the growth will continue until the minerals return to their dry state and then the bacteria growth again stalls, followed by death. Plus the other optimal factors listed above must be sustained, and as you can see there is definitely a delicate balance to making this happen. Enjoy your mineral cosmetics and the silken smooth softness and healing benefits only rice powder can offer the skin.